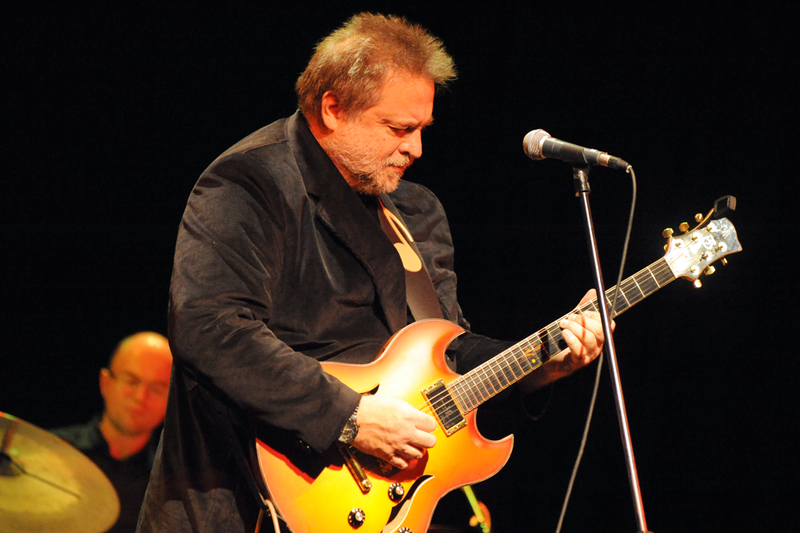 Jarek Śmietana was one of Poland’s premier jazz and blues guitarists. For four decades, from 1974 until his untimely death in 2013, he appeared on over 50 albums under his own name and in many collaborations with other artists, verging stylistically from folk to blues to experimental jazz to big band music. This tribute show is being put together by his daughter ALICJA SMIETANA, whose popularity has probably even eclipsed that of her dad, with a reputation as a great classical violinist and as the artistic director with Nigel Kennedy’s Orchestra Of Life. She’s played all over the globe and is renowned for her improvisational skills – a very unique quality in the world of schooled classical musicians. The show also features many musicians who played with Jarek, including Australian folk-blues singer/songwriter harmonica player extraordinaire BILL NEAL and American expat jazz singer KAREN EDWARDS, who has worked with such legends as Stevie Wonder, Tony Bennett, Pharoah Sanders, and Prince. Both she and Neal recorded several albums with Jarek. SZYMON MIKA is a young guitarist who has been earning praise and awards for many prestigious performances, including the Montreux Jazz Festival. His latest project is a trio that bears his name, and their album Unseen was released last year. Other musicians involved include trumpeter ROBERT MAJEWSKI and the rhythm section of YARON STAVI and JAMES MADDREN, among others, all distinguished players. OK, not a musical event, but well worth your time. CHRISTIAN A. DUMAIS is an American expat humorist/stand up comedian, whose observations on such topics as living abroad, alien abductions in Poland, and a variety of other subjects has won him over 200,000 Twitter followers. And if really smart folk like Russell Brand, Anthony Bourdain, and Neil Gaiman have given him the seal of approval, you owe it to yourself to see him now, because in a couple of years, seeing him for the equivalent of the price of a couple of beers may not be an option. Hailing from the Tricity area up north (Gdańsk-Gdynia-Sopot), The Shipyard are an interesting experimental alternative band currently touring their third album Niebieska Linia, with a sound that can veer from The Pixies to Nick Cave to Pink Floyd, with a distinctly modern Polish twist. If you’re of a certain age, it’s easy to be nostalgic for the 1990s. While much of the music and culture of that era may now seem nihilistic, at the time it was balanced with a kind of hope for the future borne of the collapse of communism, the end of apartheid, and a period of unprecedented economic growth. In other words, we had the luxury to be self-absorbed and indulgent, because more than any decade since the 1960s, the 90s felt like a new beginning, and being on the cusp of the millennium just added to the excitement. Who doesn’t want to relive at least a part of that? Or if you’re too young to have lived through it the first time, to catch a sense of what the Big Deal was? So why not don your best flannel, drink a strong latte in honor of Seattle, and head over to the Jazz Rock Cafe to spend a night listening to those classic records from grunge’s Four Horsemen of the Apocalypse; Alice In Chains, Soundgarden, Pearl Jam, and of course, Nirvana. Maybe it’ll even rain. For me personally, some of the music of the grunge era holds up better than the rest, but this clip is a personal favorite that I think perfectly encapsulates the zeitgeist of the Seattle ethos; Pearl Jam covering pre-Pearl Jam proto-grunge legends Mother Love Bone’s beautiful, yet harrowing, “Crown of Thorns”.